Yesterday, the Federal Reserve held a public board meeting to propose two new Byzantine rules to prevent another 2008-style financial contagion on Wall Street and potential crash of the U.S. economy. 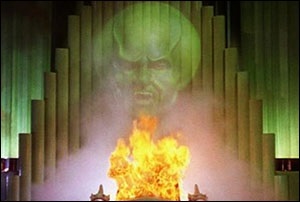 Unfortunately, the details brought images of the curtain scene from the Wizard of Oz. If you looked beyond the copious verbiage, there didn’t seem to be much there, there. Both plans appeared to target concerns over derivatives. Coincidentally, Freddie Mac, already a ward of the government as a result of the 2008 crash and a derivatives counterparty to some of Wall Street’s largest banks, reported yesterday that it had lost $4.56 billion in its derivatives portfolio in just the first three months of this year. Derivative losses were an early precursor to the 2008 crash. The second plan would establish restrictions within derivative and repo contracts of U.S. Global Systemically Important Banks (GSIBs) and the U.S. operations of foreign GSIBs. The idea is to prevent derivative or repo counterparties from cancelling the contracts if the GSIB failed and was put into resolution under the terms of the Dodd-Frank legislation. That could trigger a disorderly resolution and contagion at other banks (otherwise known as a repeat of 2008). The details of that rule proposal are here. The “subsidiary national banks” of the GSIBs are where the vast majority of the obscene amounts of risky derivatives reside. According to the OCC, as of December 31, 2015, there were $237 trillion in notional derivatives (face amount) at the 25 largest bank holding companies with the bulk of that amount on the books of just four insured banks: JPMorgan Chase, Citibank, Goldman Sachs Bank USA and Bank of America. Why is the Fed making a big deal of this rulemaking if the rule isn’t even touching the parts of the banks where the biggest threats exist? Was the whole exercise of holding a public meeting to pressure the OCC to adopt the same rule? The Fed is piling on so many complex layers of rules to the already Frankenbank structure of these too-big-to-fail behemoths that one wonders if lawyers and compliance officers at the banks already outnumber bankers. When the U.S. Congress was confronted with the same problems after Wall Street collapsed the banking system and U.S. economy in the crash of 1929 to 1932, it eschewed complexity and went for simplicity. It took care of all of these too-big-to-fail problems with the plain English Glass-Steagall Act of 1933. That legislation protected this country for 66 years until its repeal in 1999. Just eight years after its repeal, the country was reliving an epic Wall Street crash and economic meltdown. Listen to the mumbo-jumbo in this video from the Federal Reserve, our central bank that is also attempting to wing it as a regulator (while failing to ever hire a Vice Chair for Supervision as mandated under the Dodd-Frank legislation) and ask yourself if it isn’t finally time to restore the plain-speaking Glass-Steagall Act and separate the casinos from the insured banks.